The word cholangiohepatitis breaks down into chol (bile), angio (vessel), "hepat" (liver) and it is(inflammation). Putting this all together means inflammation of the liver and bile ducts. You have probably heard of bile ducts but may not really be sure what bile is. 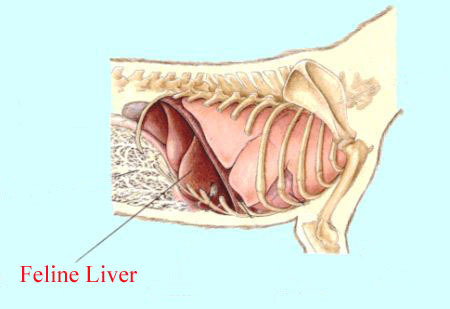 Bile is a greenish material that the liver makes, transported to the gall bladder via small bile ducts. The gall bladder is a small greenish sac where bile is stored. When the appropriate hormonal signals are present, the gall bladder contracts and squirts bile into the small intestine via one very large duct called the common bile duct. absorbed into the body. It also serves as a medium to dump toxins that the liver has removed from the body and processed so they cannot be reabsorbed. This is a fine system but problems can occur when the bacteria that live in the small intestine venture up the bile duct and invade the liver, which is normally sterile (free of bacteria). Inflammation results and the liver can fail. The cat in liver failure will require hospitalization, fluid therapy, and some kind of nutritional support (force-feeding, syringe feeding of a liquid diet or whatever is necessary) regardless of the cause of the liver disease. Antibiotics are helpful in any liver failure case as they help reduce the intestinal bacterial populations (any noxious substances they produce are normally detoxified by the healthy liver but a sick liver will not be so efficient). Antibiotics also clear the liver of invading bacteria, which is what cholangiohepatitis is all about. Expect the cat to require 1-3 months of antibiotics after recovery. A choleretic is a medication that makes bile more liquid so that it can flow smoothly without sludging. Flow of bile in the proper direction helps remove not only the toxins the liver is trying to remove in bile but also helps prevent bacteria from swimming upstream towards the liver tissue. Jessica was prescribed Destolit. A cat may well be on this medication for life after an episode of cholangiohepatitis. This may seem intuitively inappropriate for a condition that involves a bacterial infection, but some patients simply cannot get better until their immune system is suppressed. Why is this? For many cats, the problem started with Inflammatory Bowel Disease: infiltration of the intestinal lining with inflammatory cells. Immune suppression is the cornerstone of therapy for this condition. Once the immune reaction is suppressed, the lining of the GI tract regains normal thickness and function, the bacterial bloom subsides, the invasion of the liver and pancreas ceases. In some cases, immune suppression is simply needed to relieve the inflammation inherent to cholangiohepatitis. Jessica was prescribed prednisolone. Overall, cholangiohepatitis is one of the more treatable liver conditions of the cat. This does not mean that every cat will recover; some cats are quite advanced by the time they are first seen by the veterinarian. Pancreatitis can represent a lethal complication, depending on severity. The cat that survives the acute episode can expect long term medication administration and the possibility of relapse or flare-up. The owner should become familiar with Inflammatory Bowel Disease and Pancreatitis as well.